The Experiment has a gig coming up this weekend alongside our Sydney friends Roadhouses for their Melbourne 'Drinkin'' single launch. It's this Sunday September 17th at The Grace Darling in Collingwood for only $10, and Catherine Traicos is opening up proceedings at 8:00pm sharp. Come support live music and, in the process, remember what life is all about. You'll really like it. On September 5th, I had the very real thrill of hearing a couple of chamber music pieces I had written being premiered at the renowned Melba Hall in Parkville. 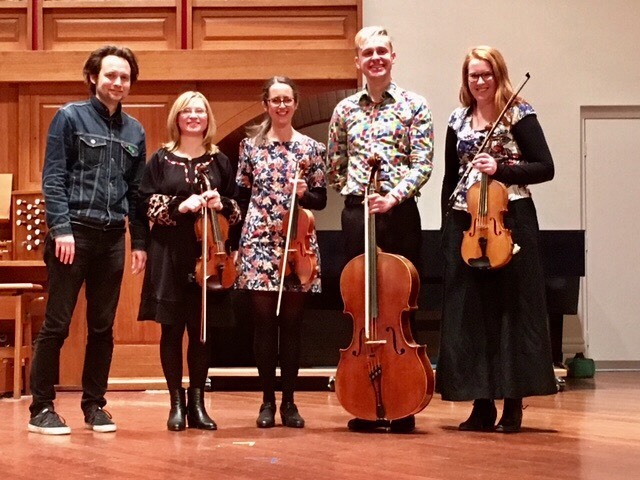 The Allotropy Quartet performed my first ever String Quartet (in three parts), and my good friend and incredible guitarist Gerard Mapstone performed a piece I'd written for solo guitar. It's hopefully the first of many concerts to come as I keep on experimenting in this field. I really like chamber music - there's something about it's intimacy and subtle power. CP with Mila Li, Kat Tsyrlin, Luke Severn, and Georgia Stibbard of The Allotropy Quartet at Melba Hall.